BOOKLIST (STARRED) -- Vaughan, writer of the hugely successful Y: The Last Man , isn't one to think small. In this opener to his ambitious new series, bits of sf space opera and classic fantasy mesh in setting a sprawling stage for an intensely personal story of two lovers, cleverly narrated by their newborn daughter. Though recently soldiers from opposite sides of a massive intergalactic war, moth-winged Alana and ram-horned Marko simply want peace and anonymity to raise their daughter (an abomination to the powers that be) away from conflict and hatred. Vaughan's whip-snap dialogue is as smart, cutting, and well timed as ever, and his characters are both familiar enough to acclimate easily to and deep enough to stay interested in as their relationships bend, break, and mend. While Vaughan will be the star power that attracts readers, do-it-all artist Staples is going to be the one who really wows them. Her character designs dish out some of the best aliens around, the immersive world-crafting is lushly detailed and deeply thought through, and the spacious layouts keep the focus squarely on the personal element, despite the chaotic cosmos they inhabit. Add another winner to Vaughan's stable of consistently epic, fresh, and endearing stories. 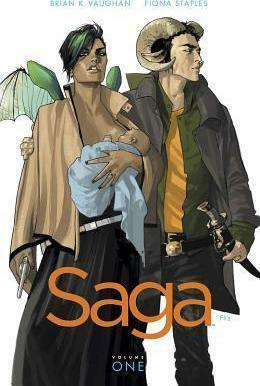 Brian K. Vaughan ist einer der bekanntesten Comic-Autoren unserer Zeit. Er wurde neben diversen Nominierungen mit zwei Eisner-Awards ausgezeichnet. Neben seiner Arbeit als Comic-Autor schreibt Brian Vaughan noch für die Erfolgsserie LOST.